I am skulking in the shadows, lurking in a back alley of a particularly unsavory city. I am a bold and brave adventurer, well-armed and heavily scarred. I fear nothing. Adoring citizens shout my name as I make my way through town, regarding me with a mix of awe and reverence. But I am not being heroic at this moment. I am not on a quest, fighting an evil foe or even upgrading my gear for the next encounter. In this moment, as the sun slowly arcs across the brightening sky, I am waiting impatiently for the vegetable vendor to open up his stall so that I can buy some celery. Because in addition to being godlike and unstoppable, I am also very, very fat. There are many ways to heal yourself in Fable 2, such as sleeping in a bed or quaffing a potion, but the easiest way is to simply eat something. All sorts of comestibles are at your disposal - everything from pie to fish to tofu to beer - and all of it will refill your health bar to some extent. As a general rule of thumb, the tastier the meal, the better you feel after gobbling it down. A crisp carrot will net you a mere handful of hit points, while munching on a pie will have you back to fighting shape in no time. My fighter, being the type to run headlong into danger, has inhaled more than her fair share of pies and as a result is looking rather doughy around her midsection. Which is why I'm waiting in this alley like a junkie trying to score her next fix: The nearby produce stall is one of the few in all of Albion that sells celery, which will help slim my character down to a more acceptable size. Not acceptable by the game's standards, mind you. This extra heft doesn't prevent her from swinging her sword with wild abandon, or even from breaking countless hearts as she strolls through town. She's a wonder, a force of nature, a heroine of truly epic proportions (both figuratively and literally). The game couldn't care less that she's plus-sized. But I do. 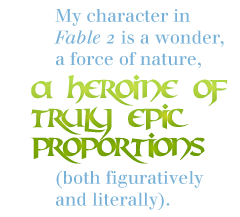 From a gamer's perspective, I appreciate the mechanic that wolfing down healing items in Fable 2 has consequences. You need look no further than Pac-Man to know that bellying up to the digital buffet has long been a staple of videogames. Cherries, ice cream, chicken, apples, sushi, chocolate, curry, cake - you name it, we've stuffed it in our virtual maws with nary a thought for nutritional value or calorie count. And why not? Videogame food is magical - how else can you explain that eating it can cure bullet holes and broken bones? In the world of gaming, you can cheat death, carry an entire armory's worth of guns and ammo on your person and eat until your sides burst without ever gaining an ounce.